Buy wine and get 1/2 off shipping when you order 6 or more bottles with checkout code "blake65"
Chad Melville really likes stems. This is a strange position to hold in the California wine industry. Professional tasters sometimes use "stemmy" as a negative. And with reason, because stems contain their own flavors and tannins that can be a wakeup call to somebody expecting pure fruit. But that's why Melville likes them. He can't put as many as he'd like in the wines for his family's Lompoc winery, Melville Vineyards, because he's not the winemaker. * But for his own small label, Samsara, he tries to ensure that at least 50% of the clusters he ferments have stems on them. "I love the aromatics that stems give, if they're farmed well," Melville says. "They add an interesting salinity to the wine. It borders on oceanic. Along with the native chaparral -- these oils in the plants, they're airborne and they land on the grapes and on the stems. You can really pick up on these things in the wine. If you destem, you're missing out on some of it." Melville's friends laugh at his stem fixation. "Did he talk your ear off about stems?" says Sashi Moorman, who like Melville works for a number of different wineries in Santa Barbara County; the two even collaborate on one wine, Holus Bolus. "We don't agree with him, you know." Destemming machines are a standard item at most wineries. There are exceptions; there are wineries that ferment whole clusters of grapes, especially Pinot Noir. But most California wineries do this to be more gentle on the grapes; the stems are just along for the ride. 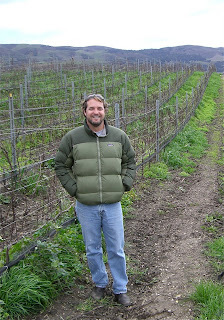 Melville is the first California winemaker I've talked to who is really passionate about the flavors of stems. Since they're not really edible, it's like meeting somebody who prefers chewing a toothpick to candy. "I like the kind of tannins the stems offer," Melville says. "It gives the wine a backbone." That said, Melville is in charge of farming for his family's 139 acres, so he has had plenty of chances to experiment with getting the stems just the way he wants them. "As the vines start to go into dormancy, the carbohydrates are drawn down into the roots," Melville says. "That's when the stems are at their best. The leaves start to turn yellow. The stems turn a little brown." Melville says Brewer is not a stem fan, so if you want to taste Melville's beloved ripe stems, you have to try them in Samsara wines. Melville says stems were more common in California wines 40 years ago, but people had different expectation of what wines would taste like. "The wines were green," he says. "People got away from that. But if you really believe wine comes from the vineyard, the stems are part of the vineyard. People smell a wine and say, 'Oh, stemmy.' For me, stemmy's a good thing." In part, it's his reaction to the fruit bombs that many California wines have become. That's the reason Melville uses native-yeast fermentation for his own wines. Here's another non-mainstream idea: he hopes to suppress their fruitiness. 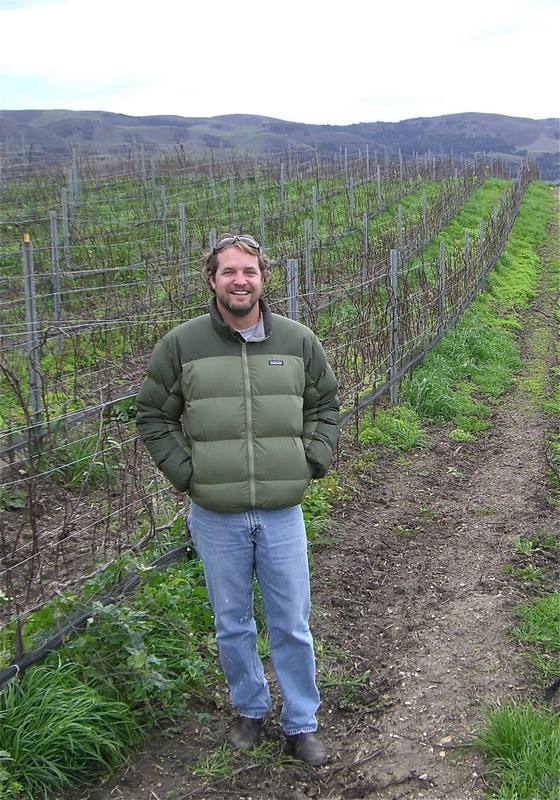 "We don't have any shortage of fruit in California (wines)," Melville says. "It can even be a negative. You have a bright light shining in your face. If you can tone down the light, you can see what else is out there." That's all interesting, but how are the wines? We had been talking about stems for a while and I'm not immune to suggestion, but I would say I noticed "stemmy" notes on only one Pinot and one Syrah. And in both cases, they helped the wine. On the Pinot, stemmy tannins gave an otherwise simple wine some texture. As for the Syrah, it was my favorite of the wines we tried: Samsara Ampelos Vineyard Santa Rita Hills Syrah 2008 ($38). I loved its complexity, and the stemmy notes played a role. So now I've had my consciousness raised about yet another word that used to be OK. I'll leave "stemmy" for the sanitation engineer. From now on, it's "pleasantly stemlike." Whole cluster seems to be standard practice in Oregon yet is relatively rare in California. As to the stems, did he make any differentiation between brown stems and green stems, beyond stating that they are "at their best" as they are turning brown? I've heard winemakers extol the flavors of brown stems and eschew the use of green stems. In CA, I'd imagine that most of the stems are (towards) brown by the time harvest comes. Any comments on stem color and the flavor differences he finds between the two? I've worked crush at a few wineries and have watched most, if not all of them, either use whole cluster fermentation, or just outright shovel stems into the fermenters. I agree that the end results gives wines with more "backbone". ps.. the winemakers I've observed are looking for the lignified stems ( brown ), as opposed to green. Stem inclusion is not a bad idea when you have very ripe fruit. It gives an aromatic lift and adds to tannin structure. I have found myself having to quality "stemmy" with the word "pleasantly" specifically because people have come to see it as a negative. 100% Whole cluster is standard in this dojo. Though (in limited exp.) I take a different take on it to Arthur. I find stem inclusion more inline and giving more depth with less ripe fruit vs very ripe. Mega-Fruity and stemmy are antagonistic flavors- Earthy and stemmy are chummy. The Melville wines that Brewer makes are at least partially whole-cluster fermented. Interesting that Chad Melville says that Brewer is opposed to stem inclusion... I've read numerous times that Brewer is a big proponent of stem inclusion. Syrah might actually be better in SRH than Pinot--too bad it doesn't sell! And I'm not just saying that based on the scores. Usually when I run into an SRH Syrah it blows me away. Maybe it's a matter of more production, but the Pinots are much more variable in quality. @Cabfrancophile: are they varied in quality or in *style*? I find if one approaches them from the latter point of view, the whole spectrum of the AVA's Pinots takes on a different appearance. Just to clarify, I was completely misquoted. Blake has tried to rectify this obvious mistake..
Greg is one of my mentors and both BC, Melvile and Samsara are huge fans of this technique. Plus ça change… Everything old is new again. Guys named Greg like stems. @Arthur, it's both style and quality at play with SRH Pinot. I recognize there are different approaches. Whatever the cause, there aren't many SRH Syrahs, but the few that are produced are typically excellent. SRH Pinot has a lot more middle of the road wines, regardless of style.